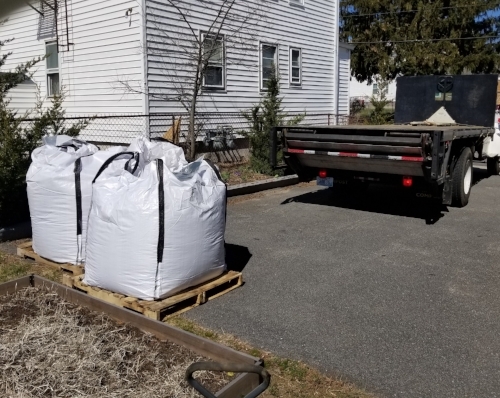 On top of our collection service, The Compost Plant also provides home delivery of high quality compost and raised bed mix to gardeners and farmers in the greater Providence area. Made from a range of "waste" resources, RHODY GOLD™ compost is ideal for house plants, vegetable gardens, flower beds, and topping off raised beds. For home gardeners looking to fill raised beds, Our RHODY GOLD™ raised bed mix offers a premium soil blend made of compost mixed with coco coir and organic fertilizer: perfect for transplanting! You have two options for bulk delivery: bulk delivery by the truck load or bulk delivery by one cubic yard sling bags. Bulk COMPOST delivered by dump truck has a 5 yard minimum. For orders less than 5 yards, compost is delivered by the 1 yard sling bag on our flatbed truck. Bulk RAISED BED MIX delivered by dump truck has a 5 yard minimum. For orders less than 5 yards, raised bed mix is delivered by the 1 yard sling bag on our flatbed truck. $150 delivery fee for dump truck deliveries within 30 miles of our farm in North Smithfield, RI. $200 delivery fee for dump truck deliveries 30 - 50 miles from our farm in North Smithfield, RI. For deliveries beyond 50 miles, call for custom pricing. Maximum load is 10 yards. Need more then 10 yards? We can provide you with a custom quote. $100 delivery fee for flatbed truck deliveries of sling bags within 30 miles of our farm in North Smithfield, RI. $150 delivery fee for flatbed truck deliveries of sling bags 30 - 50 miles of our farm in North Smithfield, RI. COMPOST and RAISED BED MIX are available for pick up at Buxton Hollow Farm in North Smithfield, RI by appointment. Please keep in mind that compost is heavy! 1 yard of compost weighs approximately 1 ton. Make sure your vehicle is rated for the weight you plan to pick up or if you’re unsure give us a call and we’ll be happy to help! Payment is due at time of delivery. Please call 1.844.741.4653 to make an appointment for delivery or pick up, the schedule fills up fast!